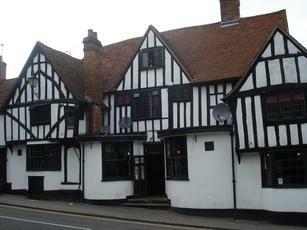 Sorry to report that this lovely looking pub across from the parish church is closed. Good looking pub from outide, which got better on entering. We were met immediatly by a large bar, lots of exposed beams and the most amazing open fireplace I have ever seen. To stand beside this with a pint was a treat. The pub also had two other fairly large rooms though these were on each side of the main room and didn't impact when only in the bar area. I should be giving this pub a decent mark, after all, the decor, fireplace, view of the illuminated church opposite were great, whilst the locals were friendly. The mark however is badly affected, as they were selling 'no beer' whatsoever. They had three pumps for real ale, all of which were however, turned around. I couldn't beleive it when told that they had just gone off (On a quiet Thursday night), and that there wasn't even any keg substitute. And so I was forced into a pint of Guiness extra cold...... Great pub, but it appears, badly managed. Pub has now reopened, the new owners have got rid of the pool table and the grotty formica tables. Seems to be aiming for a more upmarket clientel. Two real ales on but I'll see how long that lasts before rerating. Full of kids on God knows what!